A Montgomery man is dead and another in serious condition as a result of a shooting in Natchitoches Wednesday, Dec. 26 at 1:56 a.m. NPSO deputies responded to reports of shots fired in the 100 block of Cherie Loop in Payne Subdivision off La. Hwy 6 East in the Grand Ecore area. Deputies discovered two males suffering from gunshot wounds, one deceased, and the other in serious condition lying in the yard of a residence. NPSO detectives, Natchitoches Regional Medical Center EMS and the Natchitoches Parish Coroner’s Office responded. 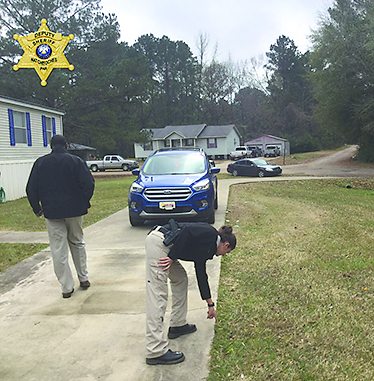 Michael R. Burks, 22, of the 1100 block of Rogers Road, Montgomery, was pronounced dead at the scene by Natchitoches Parish Assistant Deputy Coroner Steven Clanton. The body is being transported to Shreveport for an autopsy to determine the exact cause of death. A 21-year-old Montgomery man was transported from the scene by EMS to Natchitoches Regional Medical Center and transferred to Rapides Regional Medical Trauma Center in serious condition. According to NPSO Asst. Chief of Investigations Reginald Turner, detectives and deputies worked throughout the night processing the crime scene and gathering evidence. The Natchitoches Parish District Attorney’s Office was notified. Detectives are in the preliminary stages of the investigation, interviewing the alleged shooter and multiple witnesses. Further information will be released as the case unfolds according to Sheriff Victor Jones. If you have any information contact detective Jared Kilpatrick or Darrel Winder at 318-357-7830.